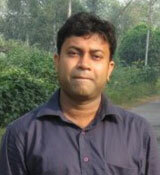 Mr. Pranay Adak, Asst. Prof, obtained his B.Tech from College of Engineering and Management(Kolaghat) under WBUT. He has been teaching C Programming , Object Oriented Programming , Web Technology , Multimedia and Computer Graphics. His current area of interest is in Image Processing and Computer Networks.